It isn’t often that the whitetail world gets a legitimate chance to headline a “biggest ever” or “new world record.” By definition, only rarely do trophies of this magnitude come along. For instance, the current overall Boone & Crockett non-typical world record “Missouri Monarch” was found way back in 1981. It’s also now been over a quarter-century since Saskatchewan hunter Milo Hanson shocked the world by taking a new No. 1 B&C typical. The “Nebraska General” shed antlers, the largest free-range typical set ever recorded, were found in 1959 but only brought to public attention in 1996. In 2000, Mike Beatty broke the Pope & Young word record — which had stood since 1962 — with a 294 0/8-inch Ohio non-typical. And in 2004, Tony Lovstuen’s 307 5/8-inch Iowa muzzleloader buck was recognized as the largest whitetail ever taken by a hunter. He held that rank until 2016, when we were treated to muzzleloader hunter Stephen Tucker’s 312 0/8-inch Tennessee non-typical, which was recognized as the largest whitetail ever taken by a hunter. And then, last fall, Luke Brewster arrowed a 320 5/8-inch Illinois giant that has taken the crown from Tucker as the newest top non-typical hunter kill. Interestingly, on the heels of the Brewster buck, we have another whitetail sending shock waves throughout the antler community. The December/January 2018 issue of North American Whitetail magazine featured a monstrous 9-point buck from southern Indiana. The deer, taken by hunter Andrea Moffett, had a gross typical score of 200 inches and a B&C net score at 180 4/8. Those numbers put the Moffett buck among the world’s elite whitetails. But it is the 2015 shed antlers from the buck that are going to blow away any misconceptions about just how big a wild deer can possibly grow. 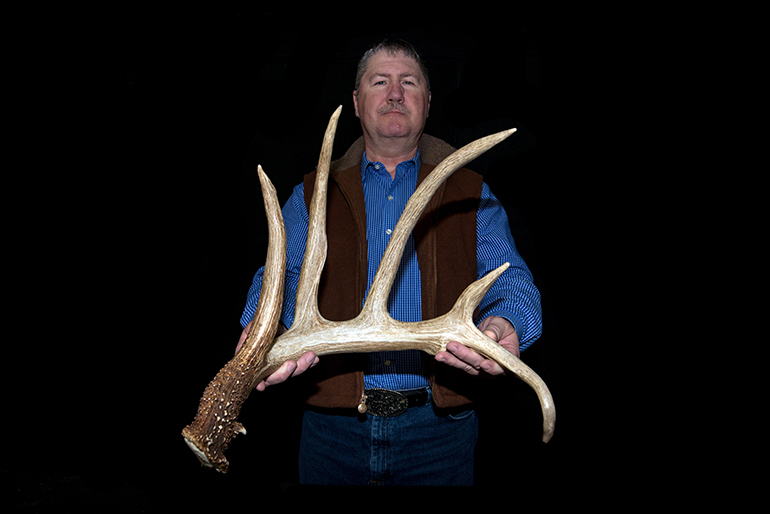 The current world record matched set of typical shed antlers listed in the North American Shed Hunters Club (NASHC) record book is from a buck known as “The Nebraska General.” That matched 6x6 set has an official record book score of 195 1/8 net inches following asymmetry deductions (without a spread credit). The largest 5x5 typical sheds listed in the NASHC record book belong to the so-called Fleming sheds from Saskatchewan with a net score of 181 2/8 (again, no spread credit). The preliminary measurements of the Indiana sheds will put them very near, or slightly over the Fleming sheds as the world’s largest known 5x5 set. The final numbers on a score sheet determine where a set of antlers will rank. However, a score is only a number — it does not always tell the entire story or describe just how big a set of antlers might truly be. Seeing the rack in person is the only way to understand the full size and visual impact the antlers have. And while the Moffett buck carried the 2015 set of antlers, he was beyond any doubt in my mind the largest typical whitetail to ever walk the earth! Let me explain. It would be impressive enough if these antlers were given a final official score that meets or exceeds the reigning world record for 5x5 sheds. That would make them huge in their own right. However, once you add on a conservative inside spread of 30-plus inches, these Indiana sheds enter a realm all of their own! Positioned as they would have been on the buck’s head, these antlers could score as high as 220 or even higher with a spread credit, netting around 210-213 after asymmetry deductions. These numbers are unheard of for a 5x5. (Again, the Milo Hanson buck, a basic 6x6, is the largest intact typical rack ever, at 213 5/8). The Indiana buck’s left side alone could cross the coveted 100-inch mark, as that with only five points (counting the main beam). 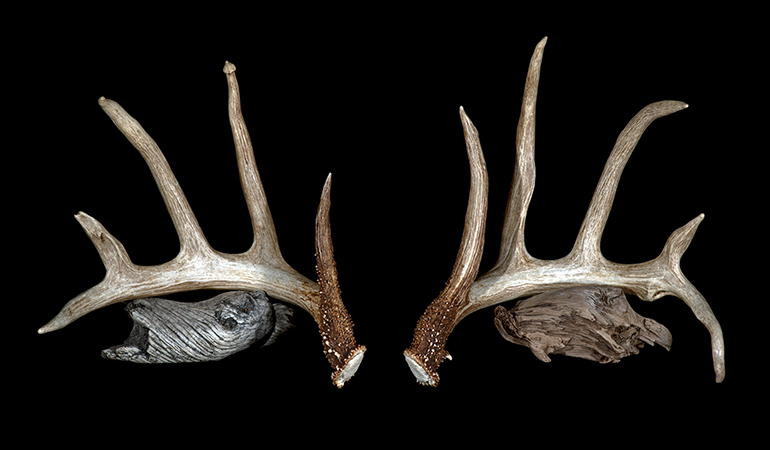 There is a very realistic expectation for these sheds to not only surpass the existing world record 5x5 sheds, but the left antler could be a world-record single, too. The typical mark for a single currently stands at 98 6/8 and is held by the Reissmann shed, a right side from Illinois in 1991. I was recently given the privilege of not only seeing and holding the Indiana antlers myself, but also was able to compare them to the racks of many other top-end whitetails. When I picked up the sheds for the first time, I was literally speechless! I stood and stared at them and could only shake my head, mostly in disbelief. I could not believe a whitetail, not to mention a 5x5 typical, could ever reach the size and magnitude of what I held in my hands. I was eventually able to form words, but even then I could only say, “Oh, my gosh” over and over. After 30 years of being around world-class whitetails and having the honor of seeing in person and in many cases holding them, I thought I had seen it all. But as soon as I picked up these sheds, I immediately understood that I had been completely wrong in my thinking. I was recently invited to New Richmond, Wisconsin, and to the office of Antlers by Klaus. Klaus Lebrecht is the world’s leading replicator of world-class whitetails; it was here that I was given the privilege to compare the Indiana sheds to the racks of other world-class bucks, including world records and many Top 10 entries. Albeit, I was comparing them to replicas, but those replicas are exact in scale and measurements. I can say with the utmost confidence that no other whitetail rack can hang with these sheds! They literally embarrass former and even current world records, both hunter-taken trophies and shed sets. I had intentions to take quality side-by-side comparison photos, but I soon realized that doing so would only diminish the perception of any racks I set alongside them! I simply could not do that to some of the biggest deer in the world. Ohio antler collector Keith Snider recognized the sheds as being world class, and he negotiated their purchase from the Moffett family. They’re now the centerpiece of the “Whitetail Legends” display and are scheduled to be seen and enjoyed by thousands of deer hunters and antler enthusiasts across the continent. 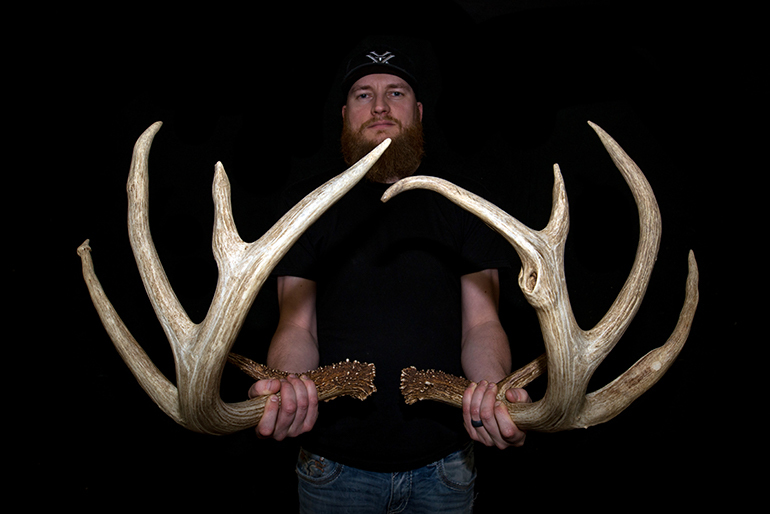 The giant sheds made their first public appearance at the Kansas Monster Buck Classic in Wichita earlier in January, and official measuring for NASCHC is tentatively scheduled to take place during the 2019 Iowa Deer Classic in Des Moines, March 1-3. If you ever have the opportunity to hold these shed antlers in your hands, I’m willing to bet that one of your impulsive reaction will be to run out the door with them — not to steal them, but to show them to everyone you know! I fought with this same urge; antlers of this magnitude need to be seen and enjoyed by all hunters and collectors alike. It was a great privilege to have been given the inside information, photos and story on these sheds in October 2018, but it was very hard to keep them quiet. It was one of the toughest secrets I’ve ever been asked to hold. There is more to be written about these colossal antlers. The entire story is one of wonder and miracles. I’ll be sure it gets told in its entirety in the near future. In the meantime, I hope you get an opportunity to see them in person. You will not be disappointed in the least. If fact, I’m certain you will agree you have seen the largest 5x5 ever known to have walked the earth!